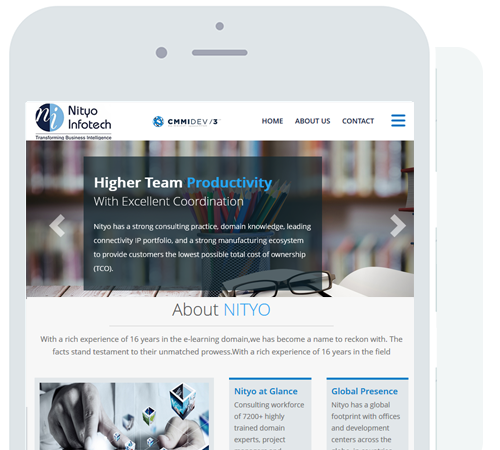 Nityo Infotech Corporation is the fastest growing IT services company. its incorporated in 2006. Key Figures 23 Countries, 27 locations 10800+ employees. We have our headquarters in the United States of America. Our operations span over 20 countries with 27 physical offices across the Globe including US, Europe and Asia Pacific. New Jersey HQ, S-Corporation. Our portfolio of solutions and services includes infrastructure management services, outsourcing , system integration, Application Software development , IT consulting, IT Security Consulting , Cloud Computing, Data Science , Big Data Analytics , Industry specific products implementation & Support , Quality Assurance & Training. Nityo provides these services to several clients located across the globe, including many Fortune 1000 and Global 2000 companies, in the commercial, industrial and government sectors - across key vertical markets, like financial services, Manufacturing & Semiconductor, life sciences and healthcare, retail, telecommunications and utilities, Top notch System Integrators, and independent software vendors. Nityo has strong geo-presence with unique safeshore Methodology to ensure global delivery Network & executing initiatives in safe Time zone with 5 safe-shore centers [India /Malaysia (2)/ Philippines / Thailand] At Nityo, our key focus is to empower our customers with customized turnkey services and business solutions through state of the art technology and best-of-breed business processes. Nityo has grown to become a global service provider of IT services, Professional Services, Outsourcing, Insourcing, RPO, Vendor Consolidation based Cost optimization & Intellectual Property (IP) Leveraged Solutions, focused on the banking and financial services sector. Nityo Infotech aims to be the most preferred Business Partner globally, by ensuring that solutions are implemented in the shortest possible span of time resulting in on time delivery with optimum quality enabling our customers to find the best resources helping them achieve their "CORE BUSINESS OBJECTIVES". Our team strongly believes in providing End to End solutions which consists of redefining and rethinking the existing business processes through our deep industry understanding coupled with world class technology solutions. We understand the importance of ‘Time - to -Market'. To address that, our team has created the best technology solution frameworks to ensure the solutions are implemented in the shortest possible span of time through our State of the art "Center Of Excellence" - COE methodology. Nityo Infotech aims to be the most preferred Business Partner of all Technology Providers and IT companies globally , by ensuring that solutions are implemented in the shortest possible span of time resulting in on time delivery with optimum quality enabling our customers to find the best resources helping them achieve their CORE BUSINESS OBJECTIVES. This is planned to be achieved by establishing associations with the global leaders in technology. Nityo has grown to become a global service provider of Infrastructure Management services, Intellectual Property (IP) Leveraged Solutions, and IT Services. Our services span from Application Management Outsourcing, Packaged Application Services, Verification and Testing, Remote Infrastructure Management, Product Development and Support, to higher value-added offerings including Managed Platform and Product Engineering Services. Globally distributed Expertise with high degree of local resources. "To redefine Customer Business Equity with best-of-breed Transformation, Technology and Talent"
"Empower our customers to focus on Core Business Competence through innovative and competitive IT and Business Process Outsourcing"
Copyright © 2019 All Rights Reserved. Powered by Nityo Infotech.